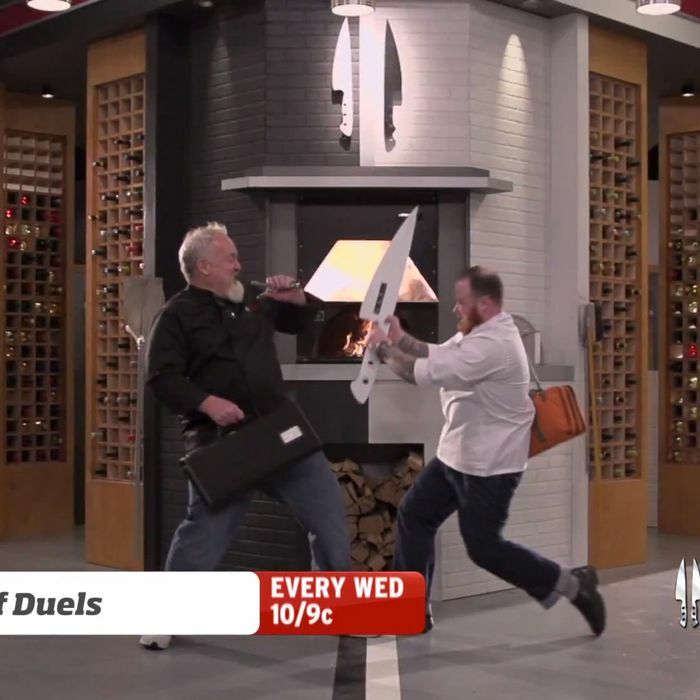 Things chefs do with knives that have nothing to do with slicing or cutting food on sturdy work surfaces in this 30-second trailer for Bravo’s new show Top Chef Duels include: pivoting one around like a baton; guillotining a hapless summer squash in midair; deploying a comically oversize prop blade on peace-loving chef Art Smith in Zack Snyder–style slow motion. The Curtis Stone– and Gail Simmons–hosted show has seemingly dispensed with the traditional, more time-consuming interpersonal setup between its competitors in favor of cutting right to the whole “heroes versus villains” chase set up in the first trailer, which is really the marrow of any good reality-TV show anyhow. Plus, getting rid of those pre-challenge challenges and sticking to the basic duels opens up the door for Top Chef Mortal Kombat and Top Chef Gator Wrastling, two shows that should definitely come along next in the Top Chef universe.